It seems to play: .... but NOTHING happens. So .. Daroon player is NO solution for me. OH MY GOODNESS YOU'RE A LIFE SAVER! 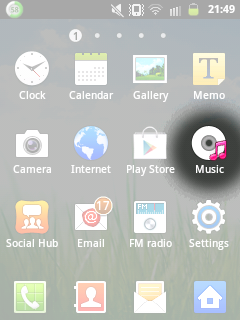 None of the other apps that I tried ACTUALLY could play the WMA files on my Android! Thank you!!! The android version of my old favorite PC player, Winamp, doesn't like wma files either. The problem is that in recent android versions, the music file database android creates doesn't read all the id3 tag information from the files correctly. Since Winamp (and many other android music players) reads the android database, it has trouble with wma files. What is needed is a player that reads the tags and creates its own database instead of using the stock android one. There are probably a number of different ones that will do, but I quit looking at the first one I found that worked: Rocket Music Player.